Want to buy Starcraft 2 for cheaper than retail? Thanks to Amazon, you can pickup SC2 for $49.99, which is a 17% discount from the $59.99 retail price offered by Blizzard. Not a bad deal for a sweet game with tons of replay value, and as far as I know this is the cheapest deal to get Starcraft 2 yet. Starcraft 2 comes on a multi-platform compatible DVD so you can install it on a Mac or Windows PC. So what are you waiting for? 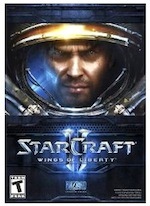 Head over to Amazon and grab Starcraft II: Wings of Liberty for cheaper than retail , plus it includes free shipping.